Keep up-to-date - follow us on Twitter for the latest BugMe! news. 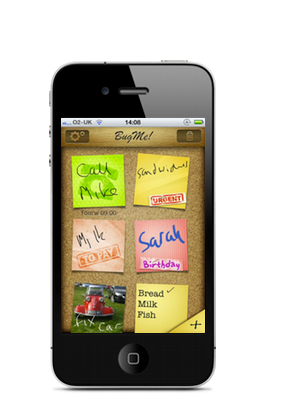 Bring your fading yellow sticky notes bang up-to-date with BugMe! Stickies, an essential productivity tool for your Apple, Android or BlackBerry smartphone or tablet. BugMe! Stickies for Android lets you use your finger or keyboard to capture quick ink or text notes. You can set alarms on your notes to have them pop up and bug you, or share notes with your friends on your Facebook wall or by email. BugMe! has an Android Widget so that you can access your BugMe! notes direct from your launcher, giving you instant access to your favorite productivity tool. BugMe! has been designed for the latest Android Smartphones and Tablets and will give your productivity an instant boost! Jot quick notes and reminders on our colorful stickies, set alarms or share notes with your friends on Facebook, email or Twitter. You can even save notes to your iPhone or iPad launcher screen as an instant reminder! BugMe! is a Universal Application which works great on iPhone and iPad - available now in the App Store! BugMe! for BlackBerry is a firm favorite with BlackBerry users. Its note-tasking, task management and alarms are so well integrated with the BlackBerry its like its always been there! Visit bugme.net from your BlackBerry for our free trial, or buy BugMe! instantly from BlackBerry App World or Mobihand, our ecommerce partner. © Copyright 2012, Electric Pocket, Ltd. All Rights Reserved.